This screen displays the contents of the Expediter’s Warehouse. 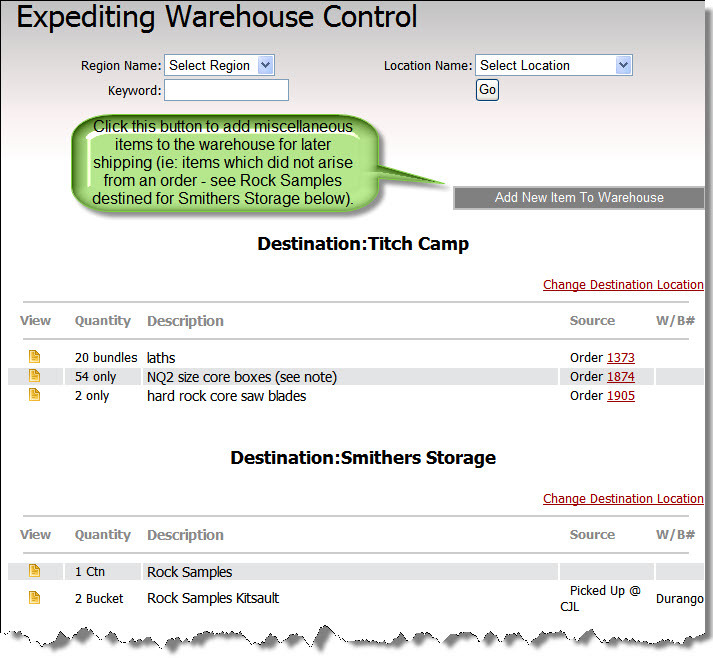 CampControl places items that are ordered and purchased in the Expediting Warehouse in preparation for shipping. Details of the items include the quantity, units, item description and the source of the item (i.e. the order number or details of how it was placed in the Warehouse). The items are grouped according to the Location they’re destined for. Alternatively, you can manually add items to the Warehouse, bypassing the order process. This is useful for synchronising CampControl with your current inventory or adding an item to the warehouse that was not ordered, for example, a parcel that was sent to the Expediters destined for Camp. See Manage Warehouse Item for details on manually adding items to the Expediting Warehouse. Click the “View” icon to view the details of a particular item line. To view this screen: "View Warehouse Control"